All ads in Yandex.Direct are moderated to ensure their compliance with advertising material requirements. You can view the Yandex.Direct ad placement rules in the Help section. On this page you will find answers to frequently asked questions about moderation. Advertising certain types of good or services on Yandex.Direct requires special documents (licenses, certificates, registration papers). You can find a list of documents that may be required in certain cases in the Help section. Use the form below to send the supporting documents. Advertising materials such as text, keywords, and links (if any) usually pass moderation within a few hours. No ads are reviewed at night. If over a hundred ads from a single campaign are sent to moderation all at once, then this might take more time. As a rule, the more ads a campaign contains, the longer the campaign takes to moderate. If you would like to reduce the moderation time, it's recommended that you split your ad materials up, and sending them to moderation in smaller instalments. Moderation of contact information takes place during the business hours you indicate, so it may take 24 hours or more. In some cases an ad may begin being displayed automatically. This means that the ad will be displayed almost immediately after being created or edited. however, the moderator will additionally check it for compliance with the advertising material requirements and it may be rejected later based on the results of the check. The moderation of such ads usually takes place within about three days. You will receive an email notifying you of the outcome of the moderation. The results will also be displayed in your campaigns lists. Our moderators work from 9:00 am to 12:00 midnight Moscow time, 7 days a week. Ads are not reviewed during night hours. 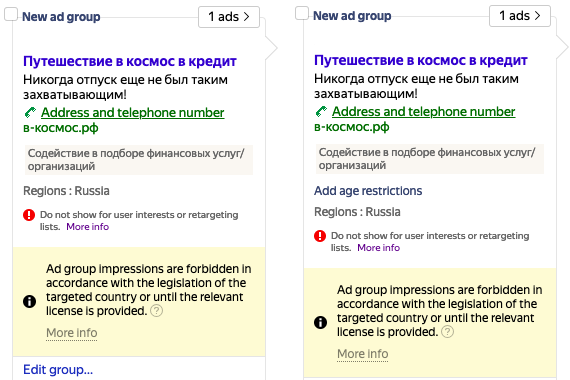 Until the updated version of your ad passes moderation, Yandex.Direct will continue showing the old version (with old keywords, bids, and adjustments). A message that the old ad is being shown will appear under the ad, next to its moderation status. After the moderator has approved the new ad, the updated one will automatically replace the previous version. Moderators may reject the keywords partially. If the ad text itself has been accepted, then the ad will start to be displayed with the accepted keywords. In this case, the ad will have the following status: “Some of the key words were rejected”. If, while waiting for moderation, you deactivated the old ad, please don't forget to reactivate it after moderation concludes. Once your ad is edited, its statistics will display only the updated text, and the list of keywords in the statistics will include only the updated keywords. If the new version of the ad does not pass moderation and you have stopped serving ads for the old version of the ad, when repeating the launch of the ad, it will be moved to the “Rejected” tab. There will not be impressions for the old version of the ad. Make the necessary changes and send the new version of the ad to moderation. If your ad has failed moderation, try to find an error yourself or contact us. logos, watermarks, and text occupy more than 20% of the entire image. Also make sure that the image meets the other Yandex.Direct requirements. Use the Yandex.Direct interface to change the image and re-submit your ad for moderation. Contact the customer service department via the feedback form. Please spell check your ad text. To do this, use Yandex Speller or any other spell check service. Use the Yandex.Direct interface to edit the ad text and re-submit it for moderation. If your ad contains a message that your product or service is better than the other products or services on the market for some reason (“product #1”, “buy only from us”, “highest quality”, etc. ), your website must contain an evidence, e.g., an independent report. If there is no such evidence, delete such statements or reword them using less categorical terms (for example, “perhaps, the best of its kind”). If at least one ad from an ad group is suspended, all ads in that group are not served until the placement requirements have been met. To start serving your ad group, archive your restricted ad or disable impressions for it. Go to the Advertising rules page. Make sure that your ads meet the legal requirements of the countries where they will be served. Make sure that you have submitted all the required documents to us. If there is an error in the ad, in Yandex.Direct interface, correct the ad text and re-submit the ad for moderation. If you have not submitted all the documents required for ad placement, submit them via the feedback form. In the Advertised subjects page, go to the relevant section. Make sure that your ads meet the requirements for the countries where they will be served. Make sure that you have submitted all the required documents to us. The list of required documents, appropriate form of letters of guarantee, and other particularities are given for each category of goods and services. You can find requirements for letters of guarantee in the Rules for submitting a letter of guarantee section. Many everyday products and services are subject to certification or licensing. For example, if your ad mentions services, such as massage, cosmetology, waxing, and regular passenger transport, to serve your ads in Russia you have to submit a copy of your license for such services. To check whether you have to submit documents to place your ads, read section Advertised subjects. If you previously placed your ad without supporting documents and now you have to provide the documents, check whether your product or service is now listed as being subject to certification or licensing. Moreover, advertising for some products or services may be prohibited. If you act as an agent, aggregator, consultant, etc., you must clearly indicate the intermediary function in the ad text (for example, “assistance in obtaining a mortgage loan”, “medical records service”). Otherwise, the end service is considered an ad subject, so you have to submit additional documentation to place your ad. Requirements for additional subjects covered by the ad are not met. For example, you are a real estate Agency and indicate, in one of your ads, that an apartment can be purchased under a loan. In this case, you have to submit documents for the loan, as the ad advertises an additional licensed service. Have we identified the subject correctly? If you want to change the current subject, edit your ad in Yandex.Direct interface so that it doesn't mention or display inappropriate products or services. Then re-submit the ad for moderation. If you want your ad to be published with the current subject, make sure that it meets the requirements for the countries where you place the ad. Then submit us the documents necessary for placement. You can find the requirements and list of documents in the Advertised subjects page, in the section describing your subject. If you need to submit a letter of guarantee to place your ad, you can find applicable requirements in section Rules for submitting a letter of guarantee. The ad is completely rejected due to errors in the text or formatting. The ad impressions are restricted in certain regions, if the ad fails to meet the legislation of such regions. To find out your ad status, look at the message in Yandex.Direct interface. If your ad has been rejected, proceed to solving problems with rejected ads. If serving is restricted or prohibited, use the restricted ad wizard. To contact the customer service department, write to us via the feedback form.